I'm back after a few months of what I thought was a well deserved break after a busy (and successful for me, minus the damned BC referendum!) 2018. I wasn't planning on building a model for the Alberta election as I thought it was a slam dunk for the United Conservatives. 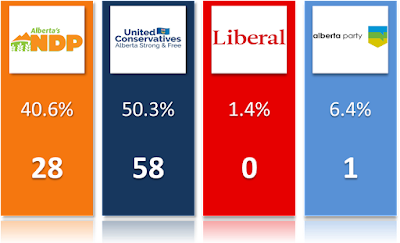 Don't get me wrong, it looks like a a UCP win is by far the most likely outcome, but recent polls have convinced me to build a model. And as usual I make it available to you because I don't believe such a model is a crazy instance of intellectual property. I don't have the simulations and probabilities yet, that will come soon. What I have a is model that accounts for the region (Calgary, Edmonton and the rest), the various by-elections, the retirement of long-term incumbents and other factors. 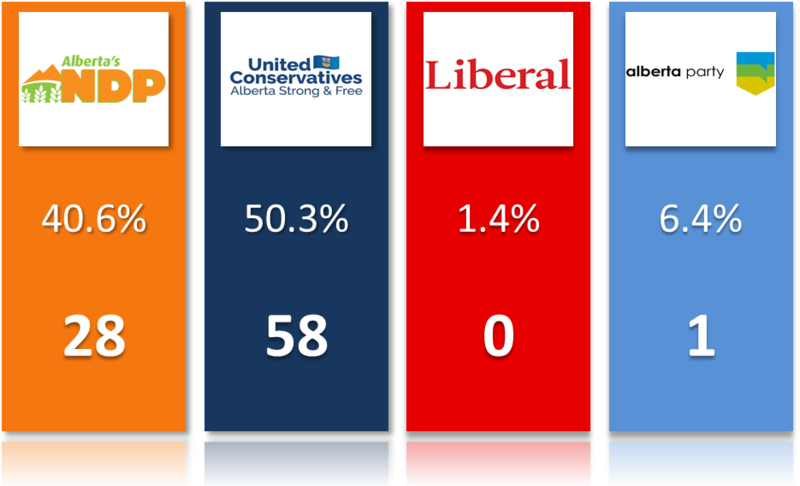 The United Conservatives' base has been estimated as 90% of the sum of the PC and Wildrose. Why 90%? Because no political merger is ever 100% successful. Polls analysis has also convinced me that 90% was the reasonable number. Recent polls have shown the NDP surging past 40%. It makes the race slightly more competitive but the United Conservatives are still ahead. 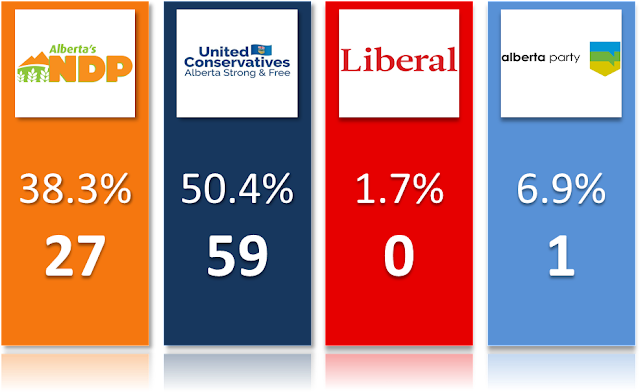 While Edmonton could go all NDP again and Calgary is the real battleground, the UCP is racking up a large number of wins in the rest of the province. 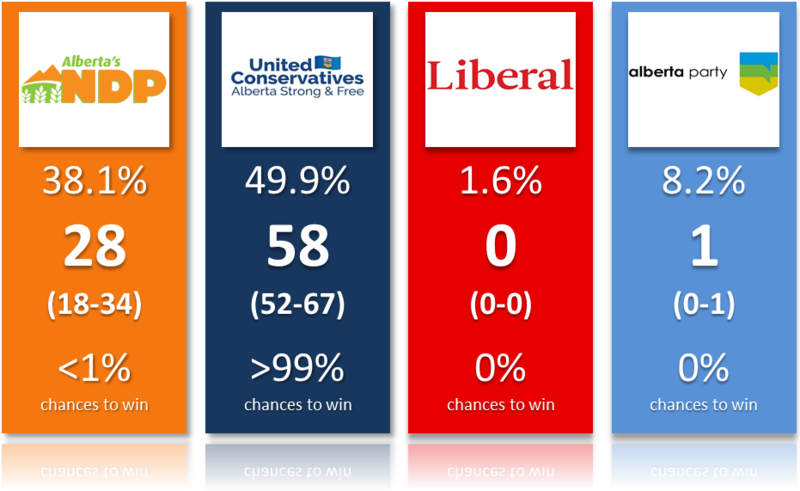 Is there a path to victory for Notley? Yes. If she manages to make the NDP vote more efficient. It means keeping Edmonton (but maybe winning by smaller margins) while being incredibly efficient in Calgary. She'd then still need some wins in the rest of the province. Right now polls show that the NDP vote might indeed be more efficient than 4 years ago but they still have the UCP ahead in Calgary. As long as that will be the case, this election won't be competitive. To be fair, I'm still surprised the NDP is even polling that high as I thought 2015 was a fluke year. By the way, the two most recent polls (daily tracker from Mainstreet) and one Ekos are currently being ignored by the "reference" projections from the CBC. The Ekos poll isn't included because it was technically ordered by a third-party firm (but still done by Ekos!) while the Mainstreet one is discarded because... it's behind a $45 paywall. This is utterly ridiculous (imagine if academic research was ignoring articles and results behind paywalls lol). It means our tax-funded public projections (the ones used as reference by many) are currently so outdated, it's not even funny. But whatever.